People have forgotten how to eat. Ever thought about why authorities use the word “consumers” rather than “customers” in their reports even though we are buying into their ideas about food whether it is for the new protein drink or new health guidelines from a government agency? Recently the European Union announced new regulations that will go into effect about nutritional labeling on foods. The EU wants nutritional labels to be easier to read and understand. For several decades now, people have relied on what they have been told by advertisers or other authorities that are supposed to have everyone’s best interests at heart. So why, despite all of this (mis)information, is Western society getting fatter and unhealthier? With so many conflicting opinions and theories about food, is it any wonder why people have an ambivalent or even antagonistic attitude toward food and eating? Perhaps it is because people have been bombarded with too much information and not enough common sense. Journalist Michael Pollan argues that there is no need for various systems featuring traffic lights, pyramids, or the aptly-named pie chart, or any kind of gimmick to tell people what is and isn’t nutritional to eat. Although he stresses that “(t)his book isn’t antiscience,” he is “skeptical of a lot of what passes as nutritional science.” Pollan isn’t a scientist, a nutritionist, or any kind of medical professional, but like the rest of us, he has eaten food daily for his entire life. Instead, he has chosen to look at the things taught to us by our mothers and grandmothers for centuries before governments and advertising agencies became involved. 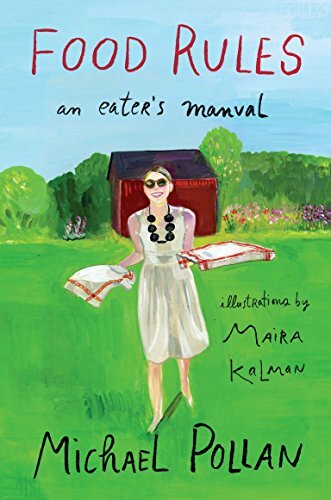 Food Rules: An Eater’s Manual is a very short book divided into three sections and consisting of sixty-four tasty tidbits of information to simplify the way we think about food. The concept of K.I.S.S.—“Keep it simple, stupid”—is germane. Michael Pollan keeps it simple but does inject some tasteful humor so as not to come across as being preachy. For example, Part One: What should I eat? Eat food. Some of the earlier “rules” revolve around eating whole foods that have not been processed or refined, or if it has been, it should be very minimal. Rules 1 through 7 are worth having on hand to help ease the guilt people may have from either eating too much or the shame from not knowing what to eat. But overall, this little book can help the reader painlessly and effortlessly eat a more balanced diet. Not all of the rules are about food. Some of the rules can be seen as reminders that by paying attention to how we eat food we can help the environment, aid the digestion, be more sociable, and even save money. Another thing to remember, as with all rules, is that sometimes it is important to pull a #64 and “break the rules once in a while.” Eating should not be intimidating or be seen as an inconvenient chore like taking out the trash—or worse, eating it. Eating is essential for survival. While Food Rules: An Eater’s Manual may not be a heavyweight in the throng of “serious” books devoted to the topic of healthy eating, it is worth having as a reminder that we are not as ignorant when it comes to food as advertisers and even government agencies may want us to believe. The human body is quite capable of letting us know if we’re getting too much of a good thing—or not enough.